To pronounce Papahanaumokuakea, just cut the word in four parts: PAPA HANAU MOKU AKEA. It is the current name of Marine National Monument of Hawaii, a chain of 15 atols North East of Hawaii Island founded originally in 2006 by president George W. Bush. It then became the largest marine reserve in the World. In 2010, it was inscribed as a mixed (natural and cultural) World Heritage Site. 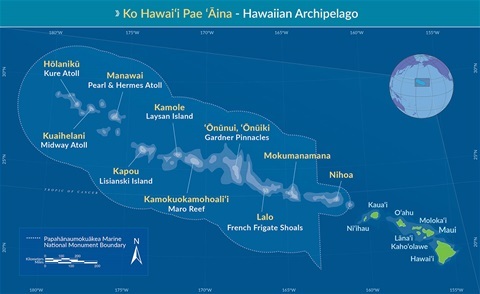 The site was initially named North Western Hawaiian Islands Marine National Monument. But six years later it was expanded and renamed as Papahanaumokuwakea by President Obama, after Papahanumoku and Akea, the Hawaiian Gods of sky and earth. -the Kermadec sanctuary in the South Pacific Ocean, north-east of New Zealand with 239.383 square miles. But the recent expansion of the Hawaii National Monument in 2016 by president Barack Obama, who was born in Hawaii, has made it the largest marine reserve in the world again. The existing ocean reserve was extended to cover 582,578 square miles (see insert with expansion). * The decision was based on the Antiquities Act, giving the president the power to designate pieces of land or sea that are part of American territory as protected areas. The Hawaii expansion The recent expansion quadruples the size of the former Papahanaumokuakea reserve. It contains a number of valuable species including the endangered Hawaiian monk seal, around 14 seabirds and the Laysan duck, which is the world’s most endangered duck. And there are also whales, sea turtles, yellow fin tuna and the big eye tuna that will profit from protection. The region includes six huge underwater volcanoes, one nearly 14,000ft high, and the USS Yorktown, which sank during the Battle of Midway and was discovered in 1998. Mining and commercial fishing will be banned in the area, although recreational fishing with a permit will be allowed to continue. Long lining with its negative impact on the environment will not be permitted. Of course the new regulations triggered protests from Hawaiian fishermen who can still catch all they can catch now, but will have do it in different and more remote areas. Future and protection of MPAs In contrast with the fishing companies, environmentalists and scientists have reacted enthusiastically to these recent developments. But some also stated that MPAs are not isolated but part of a much larger environment that remains threatened by climate change and pollution. A skeptic could say that the recent surge of MPAs could just be an easy way for national governments to polish up their environmental image. Nevertheless, there still remains a posssibility that they will prove effective on the long term in building a refuge of untouched ocean to protect and conserve a wealth of marine life. An crucial question however is if the local authorities will succeed to protect and guard these immense areas. In the past it was proven difficult if not impossible to actually stop pirate fishing in remote MPAs.